CRIME LAB is system that allows apartment complexes or private property managers to enforce their dog poop pickup rules. The system comprises a database that can match dog poop criminals with their own poop using DNA analysis. If you are tired of the dog poop being left on your property and residents are unhappy with the conditions, you need to call "CRIME LAB" for help solving this messy problem. 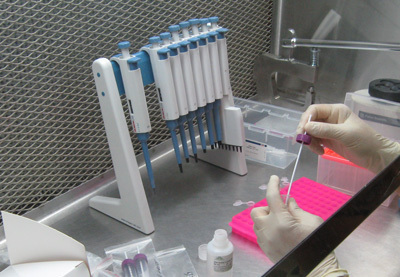 Isolating DNA from dog poop is a complex process that is then followed by PCR and the final Electrophoresis steps. This 15 minute educational video from youtube.com shows the steps in isolating DNA to get it ready for analysis. As you will see, it is a labor intensive and sensitive process. Once the DNA is collected and processed, CRIME LAB is able to match that DNA fingerprint with those collected from each residents dogs. The results are returned to the property managers so appropriate action can be taken against the offending parties. CRIME LAB Dog poop testing is a proven method to reduce dog waste left on properties. If you have a problem with dogs pooping in your yard, look at our do it yourself kits as the ultimate solution in dog poop crime fighting.